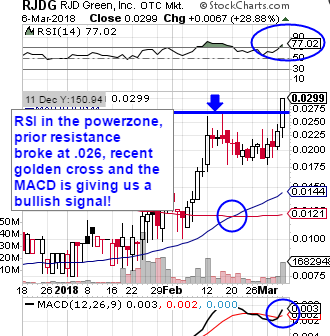 As you can see on the included chart snapshot below, current indicators suggest RJDG could be primed for even more bullish activity, so we’ll continue to track as we cruise through midweek. We also want to mention RXMD for the third consecutive day this week. As we said yesterday,our February 22nd alert on the stock allowed us the chance to get in for as little as .0663. During yesterday’s session itself, the stock once again broke out to new annual highs, hitting .1729, which marks a 161% upswing over a span of just nine trading days. Also in yesterday’s premarket report we included options ideas for the SPY, which looked set for another bullish session. We targeted the SPY 03/07 $272-273.50 Calls and got really good double-bag intraday results from all of those contracts. We tagged NBEV as a possible bottom-bouncer in our premarket report yesterday morning, and stock has definitely risen to the occasion with the beginnings of what could be a significant rebound. The stock had been trending down for the better part of the last six months, having started the summer trading at more than $6/share. It seemed a good time to call a bottom, and so far our idea is looking good. While it’s off to a slow start, rising just 17% from 2.20 to 2.58 yesterday on its highest volume in over four months, we feel good about the chances of a more sustained move, especially with the stock hitting a new high of 3.42 in the premarket today. From yesterday’s low that’s already a swing of 55% We’ll be sure to keep an eye peeled for further movement from this bottom bouncer. We’re no strangers to trading DAL options. It has traditionally been one of those companies we can count on to provide good post-earnings opportunities after a beat, and today the company exceeded expectations across the board in their Q4 report. We’re are going to signal a range of contracts which will be expiring tomorrow to try to garner some rapid-strike chances. Our targets are going to be the DAL Weekly $57-58 Calls. PTOP has been the main point of focus on the stock side of things for us this week, keeping us coming back to update the fantastic gains it has made. The stock has been setting new highs by leaps and bounds. Just yesterday morning we were pointing out the 7025% gain we’d seen since our initial alert on the stock on November 8th after which time it would trade for as low as .0004, before running all the way to .0285. We highlighted and began tracking a range of options for AT&T back on November 9th, and wanted to circle back this morning to update the progress on those as T stock has continually trended upward ever since. Our targets were the T 01/19 $34-36 Calls, and the ranges we’ve seen on those contracts have been rather impressive. The following figures represent the lows shortly after our first alert o the new highs achieved this week. .
Fresh Idea: Nike. Inc. NKE - After a post-market earnings letdown yesterday, combined with an already toppy chart, we may look for the possibility of gains in the NKE Weekly $64-62.50 Puts* to close out the week. * Never trade weekly options on a Friday unless you’re an expert trader with disposable funds. It’s very risky!